Our intakes of pesticide residues are increasing day by day, as most of our foods are treated with harmful pesticides. It is impossible to completely get rid of pesticides, unless you completely opt for organic food. And, all of us are aware of how expensive organic foods are. 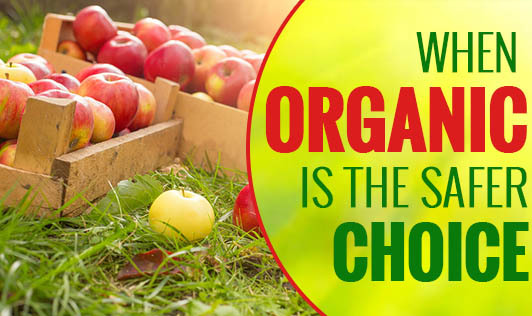 But, there are certain foods that are better to be included in the organic shopping list. Tea: Tea leaves are loaded with pesticides and are directly subjected to processing for tea powder without any attempt to reduce the pesticides. As tea is a regularly consumed beverage in most of our families, it is better to opt for organic tea. Milk: Dairy cows are regularly fed on pesticide-covered grains, hormones, and antibiotics. Studies show that these residues are found in the milk obtained from these cows. It is highly recommended to change over to organic milk if you have toddlers in your house. Meat: Animals are fed on antibiotics and synthetic growth hormones. Eating this meat could contribute to antibiotic resistant bacteria that could affect health and food poisoning. Eggs: Pesticides pass on to eggs from chicken through their feeds,and further into the foods in which they are used. Organic eggs can be a better option to prevent your food from getting adulterated by pesticides. Apples: Apples are a commonly eaten fruit. USDA survey shows that it is one of the top most foods with the largest amount of pesticide residues. So, this fruit can also be added in your organic shopping list. Small changes in your choice of food can help you stay safe from the hazards of the environment.